Baskin-Robbins — Get a free scoop of ice cream for good grades on your report card! Blockbuster — Get a free family friendly movie rental for A’s on your report card! Cheryl & Co — Get a free cookie for every A on your report card! Chick-fil-A — Bring in your report card showing all A’s and B’s,and receive a FREE 8-pack of nuggets! Chuck E. Cheese — Chuck E. Cheese believes in the value of a good education. Have your child bring in their most recent report card and they will receive FREE tokens for good grades. Family Video — Get a free rental when you show your good report card! Krispy Kreme– Get a free donut for each A (up to 6 A’s)! McDonalds — Students with straight A’s can get a free Happy Meal! Pizza Hut — Each marking period, any child who has 3 A’s or the equivalent thereof, will receive one Personal Pan Pizza and a small soft drink or carton of milk by presenting his or her report card to the manager. Sbarro Pizza — Any student with A’s and B’s on his or her report card automatically becomes one of our PizzAchievers. Sbarro will then provide every PizzAchiever and an accompanying adult with a free slice of cheese or peperoni pizza and a small soda! Topps — The Topps of the Class program has been created to give you a great trading card gift when you put your mind to work. Every time you bring in a report card to this store, the manager will award you with a gift! Limited Too – Get $5 off any Limited Too purchase when you take your report card into any retail store within 30 days of issuance! As some of these may be at participating locations only, I highly recommend that you call ahead to ensure that your particular store is offering these freebies. 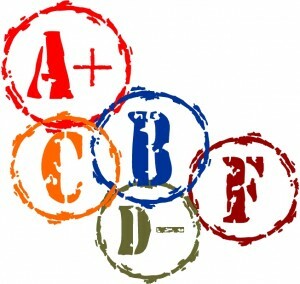 Do you know of any other good student/good report card freebies? Thanks to Saving Dollars and Sense for many of these offers! I remember when I was a kid I was lucky to get a personal pizza for reading books (through Pizza Hut). Looks like good grades can really pay off for kids these days! my 8 yr-old son doesnt get a,b,c -he gets e,m (exceeds or meets). We homeschool, thus we don’t have official Report Cards. Any suggestions? we made our own report card and the stores we take it to have no problem. we also do a 1-4 scale instead of A,B,C,D,&F and they have no problem with that either. Here’s a post that answers what to do if you’re a homeschooler like I am. Limited Too is out of business – all stores should now be Justice brand. I was told last year by the manager of the Justice store that they no longer offered the $5 off/report card incentive. Also, it would be helpful if the links went to a description of the program, or somehow verified the incentive, instead of just linking to the companies’ general websites. I have a feeling a lot of these are regional and/or only offered by specific franchisees (McDonald’s, Chick-Fil-A), or outdated altogether (Limited Too). I did link to the promotions when available. Unfortunately, many of them don’t have information available online. It’s true that some may be regional/franchise specific offers, which is why I recommend calling ahead to verify. Our credit union will deposit $5 in our child’s account for a good report card. My kids just got a sheet home from school that says if you read 12 books this summer you get a FREE book from Borders, Borders Express, or waldenbooks…You just have to bring in the paper with a parent signature..
i am the computer dummy in our family – don’t know how to link for you and everyone asleep. borders in our area also offering a 20% coupon along with huge sale and workshops for kids on saturdays. Thank you for finding these! Even when I go to most of these web sites, I still don’t find these deals. How do you know about them? I passed them on to my friends along with the source link. H-E Buddy Summer Reading Program – download and print form. Read or have books read to you. (if not old enought to read yet) You recieve a t-shirt, certificate and sticker. We have done this several years now and the t-shirts come quick. If you choose to do the Baskin Robbins one, call your local store ahead of time. Ours does not participate. I read that Cold Stone creamery has some incentive, but again call before going. On the summer reading incentives that someone mentioned, Half Price books usually does a summer reading incentive. If you have Rave movie theaters, check there as well. The past 2 summers, they gave a free movie ticket for each 3 to 5 books read (I don’t remember the exact number). Although some may not agree, I honestly believe that if one site or franchise offer an incentive such as this it should be manditory that they all do. It clearly means more business for them all. Today when we passed our publix, they had a sign saying free ice cream/frozen yogurt to kids with good grades. It might just be our publix, but i doubt it. OK not quite along the same line of good grades but I love that Kroger and Meijer has the free cookie club for little shoppers. It is simply good business. Happy kids = moms who shop longer = more $$ spent at the store. While I understand the incentive behind this I wish there were more healthier choices! Or other options. My son who so far has got all a’s & b’s this school year & last year got all a’s & b’s (with the exception of 1 high c) loves places like Trader Joes, Whole Foods, Half Price Books, Barnes & Noble & The Crepevine. I wish places like this offered incentives for good grades too. Not to mention Pizza Hut & Blockbuster have gone bankrupt & are almost non existant nowadays. If you would like for your favorite store to offer good grade incentives, please contact them. They may offer something and it’s just not on their web site. If they don’t already offer something, they may consider beginning a program since you asked about it! :) Good luck! There are also different ways of payment options available in online shopping. quickly as the shop closes. Wonderful site. Plenty of useful info here. I am sending it to some buddies ans also sharing in delicious. And of course, thank you for your effort!